It has been a sad time these pass few weeks, my Father died on the 24/4/10 he had prostate cancer which had spread, he spent his last 2 weeks of life in a hospice with his family around him he received superb care and died peacefully. He had wanted to go to his grandsons christening which was yesterday but it was not to be. I have found my cross-stitch a great help as I took it to the hospice and sat by his bedside and stitched for many hours. I had already mentioned in an earlier post that I was going to knit a soft toy to go with the Birth Sampler I made for my Nephew Christening here he is Geoff the Giraffe he was taken from Knitted Wild Animals by Sarah Keen, I may have to knit a couple more of them as he was very popular once people saw him. Here is the Birth sampler framed it was not easy choosing a mount to go with the stitching, I am very pleased by the end result. 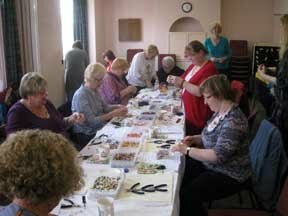 I went to a workshop at Robinhoods Bay last week which was a welcome distraction, It had been arranged by Jenny we had requested a workshop on finishing Techniques so she had invited Julie from Spellbound Beads who worked us hard all day. She showed us how to make loops with wire and wrapped loops, how to open jumprings, Calotte crimps and beading threads, Alternative endings for multi-stranded designs, use of stranded beading wire and crimps how you hide the thread in beads and the use of lace ends. When we arrived all the equipment needed had been provided for our use and she had brought loads of beads for us to uses, we had all been given a bag of findings we would need to use. We all came away with many finished items earrings, necklaces and bracelets, usually I came away with a bit of beadwork about 2-3 inches long and certainly not finished. So sorry to hear about your father...My thoughts are with you. 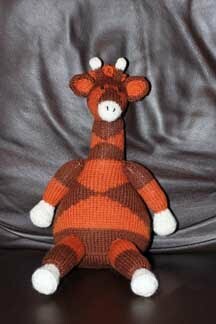 Love the giraffe you made to go with the sampler! I am very sorry for your loss. The sampler looks lovely, perfect. I am glad you have something positive to show for such an awful time. I am sure your father would very much approve of such a lovely finish and its purpose. I am so sorry to hear about your father. I am glad it was a peaceful death. The sampler looks great. Congrats on finishing it. Cute giraffe too! So sorry to hear about your father. 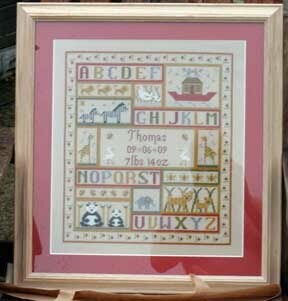 The birth sampler is wonderfully framed, it's a pleasure to look at it.